Yes. He said it right. It’s not easy. Here’s another comment to prove that it’s tough. I would like to know what companies can hire international students for these Streams. I have applied some companies to get an Internship but it was no use. Every company needs US citizenship. As a F-1 student how can he search a job or Internship? Are there any Web Links to know? Please Reply. So, the first person said, it’s tough. The second person showed why it was tough. But, why? Why do students find it tough to find a full-time job or direct hire job on OPT? I know the answer. Let look at this graphics. 1. The person who is looking for links to apply for jobs would perfectly fit this category. Applying for some random jobs with a resume would typically give no results. No Interviews or no job offers. 2. If you have a basic understanding some aspects or some aspects of how to search and apply for jobs, you may get one or two interviews calls. Did I say, when employers hear H1B Sponsorship, they could trash your Resume. Game Over. 3. Now we are moving into experts territory. You probably spend 20 to 30 hours of deep work learning how and where to apply for jobs. You are not posting questions in the blogs asking for links to apply for jobs. Maybe have a professional write your resume. You would start to see more interview calls. Yay! Progress. 4. Now, we are talking baby. When it rains, it pours. You can pick can choose from competing offers. You can have employer compete for you. You can now negotiate your terms. Well, it takes time and effort to be an expert job seeker. Whoo Whoo. 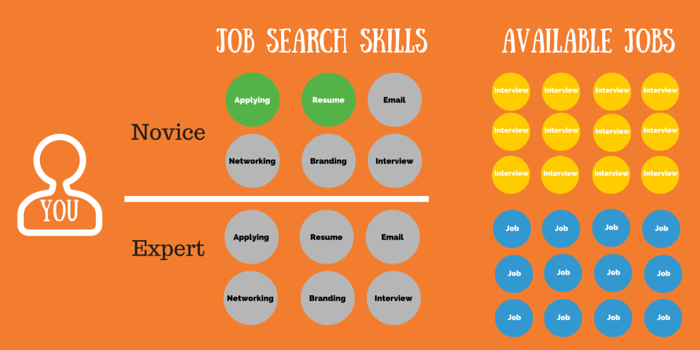 How do I become an expert job seeker? 5. If you get sick, you will go to a Doctor. If you want a degree, you will go to a college. If you want a job, you assume you are the expert. That’s the problem with International Students. But, now you know why your job search is not yielding any results. Where can you learn some of those strategies? sir, i have work expereicne of 3 years in india. but,my company gave me salary to me in cash payment. so, i have not my pay slips, salary bank statement and income tax return of my indian company. so, in future, i want to apply for H1B visa. so, at that time , i must need pay slips, salary bank statement and income tax return of my indian company? and if in case, USCIS give me REF( request for evidence) , then, what should i say to USCIS ? The best advice I can give is to start using these resources during your first semester!! Go to every workshop you can – every time it’s offered. They are usually free, and sometimes they even feed you or give you free t-shirts. The mistake many students make is waiting until one month before they graduate to start thinking about the job search. Think of how much more relaxed you’ll be at that first post-graduation job interview if you’ve been practicing already for a year or two with actual hiring managers. Check out your career services office (it might be called something different at your univ, but look under student resources and you’ll probably find it) and start taking advantage of the services they offer. Your student fees pay for it, so you might as well use it!! I wanted to drop some subjects for the summer semester and register for the fall semester. My graduation is planned for the summer semester and even my opt i20 is generated but i havent applied for the opt yet. I would like to know if there are any major risks with program extension or taking cpt in next semester after the program extension. I really appreciate taking time to help me. My daughter was an Intl student too and really worked hard applying and getting interviews in different big companies in the US.Her university gives a lot of support if you ask for help and assistance.She was advised by the career dept of the university to apply only to big co ‘s because they have lawyers attending to H1 visa sponsorship.Of course the H1 visa is a lottery but with faith and trust in God ,she just got her H1 visa and her co is processing her papers now. Applying for a job is very competitive too..you must have a good GPA. Totally agreed. I had my Resume done professionally and got many more interview calls. However, I am still building my interview skills. I failed many but every interview is a learning experience. The most important thing is to have positive emotions despite failures and not give up. I came across many employers who don’t care about status but experience and knowledge. how to get a resume professionally written? Did you use the services of a professional? Eshan Patil — How did you prepared your resume professionally through college or outside sources. And is it one page resume or more than that. Can you please elaborate on your preparation. Hey nani did you get any links. Even Im looking to apply for mech companies. Did you even realize that I quoted your comment and criticized you for approaching the job search like that. Guess what, you are still in the same boat.